Technically It Does Not Getting Better Than This! Well, that double bottom turn out to be a major head fake. After the FOMC news, we broke through the 50 day moving average and proceeded to make new lows. I told my self that the low volume bounce into the meeting was a sign of a 'sell-the-news' reaction and that is exactly what we got. 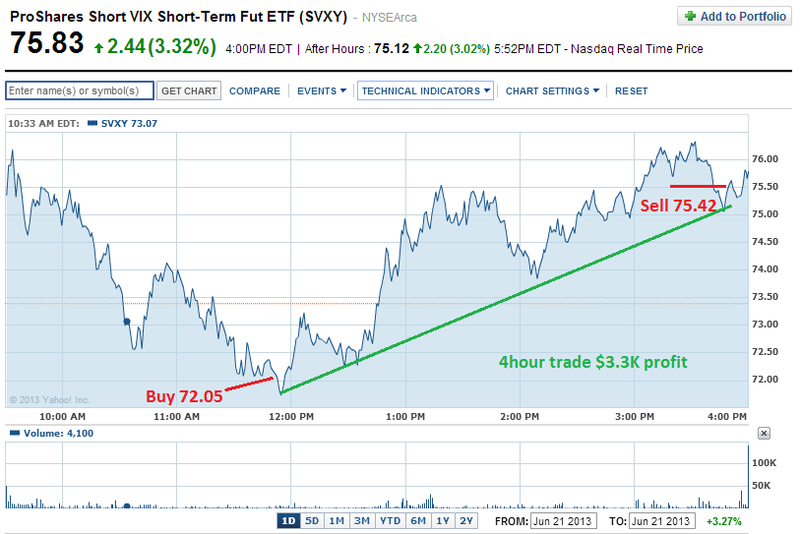 I even put in a contingent sell order right before the news for my long $XIV position. It triggered and I was totally in cash, in my personal account right after the news hit and at my all time high. I should have left things alone. The market actually spiked up and down after the news. After a spike down, I figured it should go right back up. The Fed news was nothing new and my read was they would continue to provide monetary stimulus to the economy. The Fed news should be good for Stocks, but I guess everyone else was long too, so we proceeded to go down even further. 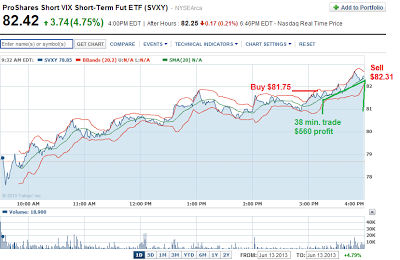 I decided to buy 1000 shares of $SVXY at $84. Big mistake! I didn't have a stop order so it ended the day at $82.89. 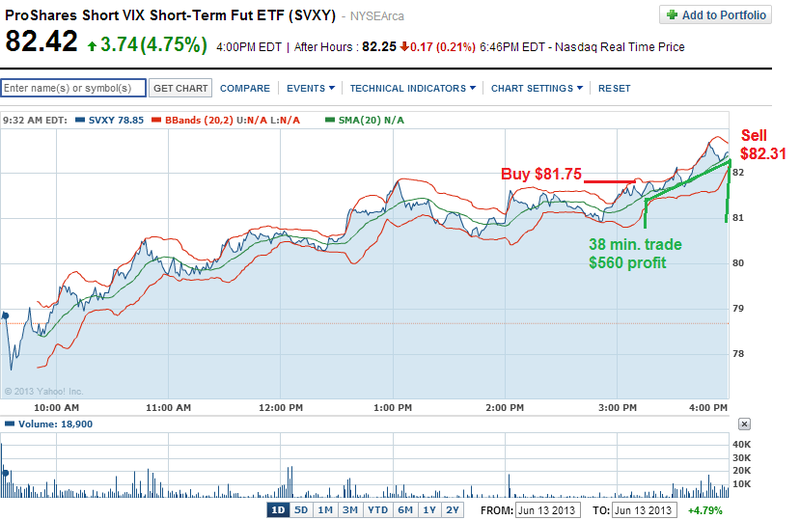 On Thursday the selling continued and SVXY went to $71.28. When volatility spikes, this ETF goes down big time. I held out until Friday, hoping for a relief rally. We got a gap up in the morning and SVXY started the day at $75. It proceeded to go down to a low of $71.70. I wanted to sell out, but decided to bite the bullet and use my margin account to double down and try to get back to even. I bought 1000 more shares at $72.05. It was about 5 minutes shy of the day low and SVXY proceeded to climb all the way back over $76. I finally cashed out at $75.42. Not quite back to even, but close enough. Still up for the year and up for the month! The S$P 500 is about to confirm the bottom. It was not a V-shape bounce, but a W-shape bounce. Usually W-shape bounces are better than V-shape bounces. The 50 day moving average held and MACD about to cross. It doesn't get much better than this for Longs. We should be able to hit 1670 without much effort, which is the top of the Bollinger Band. This just happens to coincide with a Fed Meeting tomorrow, so it could mark a top or we could continue to slowly ride the upper band. 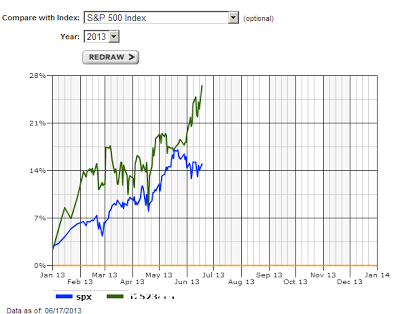 The market regain its traction today. Was busy most of the day with work, so make a final hour trade with $SVXY for a quick $560 profit. This ETF is short the $VIX futures contracts. When you buy this you are betting the volatility will be lower as measured by the $VIX. This ETF is extremely volatile with 3-5% moves in one day. $SVXY generally goes up when the S&P is up and even when it is flat due to the contango nature of the VIX futures contracts. The ETF will short the 1st and 2nd months VIX future contracts and generally the fund increases in value as the future prices decay to the spot price, which is generally lower in value. Terrible day in the market today. The DOW open up over 100 points and then proceed to close down 126 points for a 200 point swing. This is a change in character for the markets. It was a nice bull run for the first 5 months of the year. 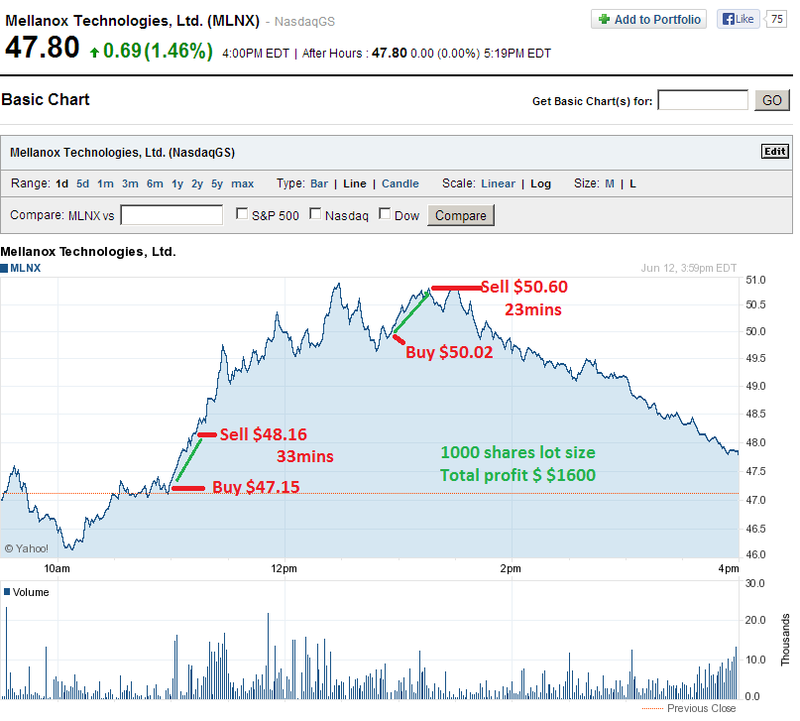 Buy and hold was the best way to profit. Now we seem to be correcting from that amazing run. We should be shorting every spike and covering every dip. 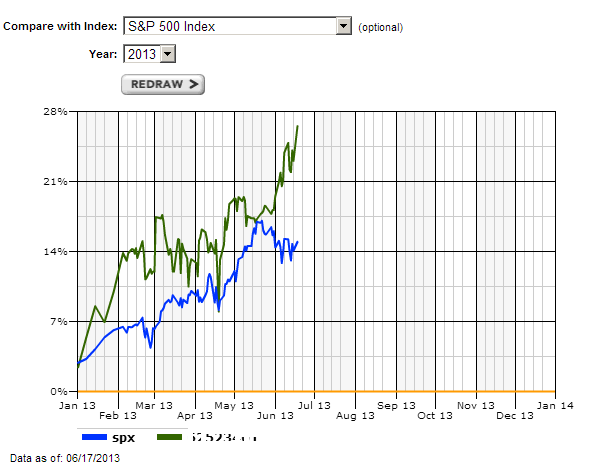 It should be a good time to trade the extremes, versus just riding the trend. I sold my $SPXL long into the early morning spike for a small loss. Holding onto my $XIV long position, since this should eventually revert to its mean and I should be able to profit from. I saw $MLNX in play. It dropped over $1.50 in the first 30 minutes and started a fast run higher. I recognize the pattern of short covering and this one has a high short interest. I made an initial purchase at $47.15. 33 minutes later it spiked over $1 and I cashed out at $48.17. 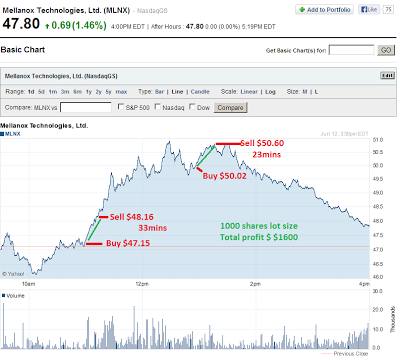 MLNX proceeded to go up another $2 from where I sold it. Damm, but a profit is a profit, so I'm not complaining. After reaching a high of $50.98 it came back down to $49.50. I decided to make a 2nd play and bought at $50.02. In 23 minutes, it went over $50.60 and I cashed out. It was a nice double take scalped and good thing I got in and out as I did. The stock proceeded to drop back down for only a .69 gain, for the day after being up over $3. I should have shorted it in the later afternoon, but did not want to be greedy on one stock. I noticed something odd this morning with the $VIX and the VIX Futures. The VIX (Volatility index) was down, which usually means that the VIX Futures should also be down, as tracked by the VXX or UVXY, but they were actually up. When I actually looked at the VIX futures, yes, they were trading up, while the VIX was trading down. So I got to thinking, why would VIX Future people be buying the VIX Futures, when the spot VIX is actually trading down. My only conclusion was that if I were a large Mutual Fund or Hedge fund that was going to sell a large amount of S&P stock and I knew I would move the market, then what would I do to hedge myself? Well, if I knew I could push the market down with my selling, then I would buy puts or buy VIX futures knowing that volatility would increase dramatically and I could profit from my selling. 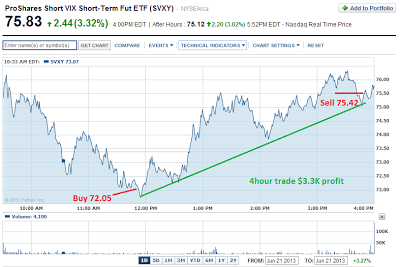 Sure enough after 1:20PM EST, the selling started in the SPY and the VIX Futures spiked up. This might become a good indicator of a pending sell off in the market. I will keep watch eye to see if this theory holds up.